MWC 2012 is well underway, offering the world the fastest, sleekest and most powerful new mobile devices on the planet. This year quad-core processors are a big theme from all the top manufacturers, while we've also seen several tablets launch. There have been big announcements from all the top mobile manufacturers. We're in Barcelona to bring you all the latest news and hands on reviews - read on for links to them all. Before the show, Samsung stated the Galaxy S3 would not appear at MWC 2012. But that hasn't stopped the rumour mill. Leaked details at the show suggest the new handset will be running a 1.5GHz quad-core Samsung Exynos processor, which is a next-generation ARM chip based on the A15 core. Samsung has instead unveiled the next in its second-generation tablet range: the Samsung Galaxy Tab 2 10.1. Following on from the Tab 2 7.0, the new larger-screened device features the likes of Android 4.0, a 1GHz dual core processor and a 3MP rear-facing camera. There's also a larger version of the Samsung Galaxy Note - check out our Hands on: Samsung Galaxy Note 10.1 review and read why we think it might exist. The Galaxy Note 10.1 boasts a 1.4GHz dual-core processor and HSPA+ connectivity as well as the company's S-Note software for taking notes (which is what differentiates it from the Galaxy Tab) and Photoshop Touch too. There's also the the Samsung Galaxy Beam, a new handset (rather than the prototype we've seen before) which features a frame that's only 12.5mm thin, a dual core 1GHz processor and a 5MP camera on the rear. Here's our Hands on: Samsung Galaxy Beam review. Samsung has also officially unveiled the Galaxy Ace 2 and Galaxy Mini 2. Check out our Hands on: Galaxy Mini 2 review, Hands on: Samsung Galaxy Ace 2 review and Hands on: Samsung Galaxy Ace Plus review. We also got up close with the Galaxy S Advance - here's our Hands on: Samsung Galaxy S Advance review. We've now heard that Samsung has revealed the Galaxy S WiFi 4.2 with claims that it offers the best of Android experiences with powerful gaming on the go. Samsung also told us it is planning on launching Windows Phone 8 handsets and possibly even Windows 8 tablets too. A Samsung spokesman also got into a bit of a pickle as he said that the company wasn't doing that well in tablets, something the company later looked to dispel. Another chap we spoke to said that Samsung is looking into releasing an NFC-enabled tablet. 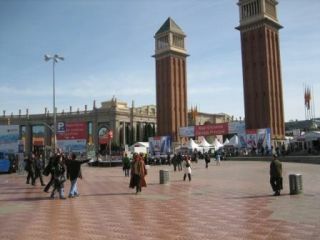 MWC 2012 is the first event where we see the Sony brand fully taking over the Sony Ericsson portfolio,. We'd already seen the Sony Xperia S at CES 2012, but the Xperia Nypon and Kumquat are very likely to be the 'What's new' stuff the brand has promised at the Spanish event. Sony has now debuted the Xperia U and Xperia P at the show - check out our Hands on: Sony Xperia U, Hands on: Sony Xperia P and T-Mobile, Orange and Three set to stock Sony Xperia U.
Sony also told us that its White Magic screens can't go above four inches - which is why it's not been used on the high-end Sony Xperia S.
LG has officially unveiled a raft of new handsets and, what's more, it says that all 2012 handsets will be upgradable to Android 5.0 Jelly Bean. The rumoured X3 turned into the official LG Optimus 4X HD. This monster sports a 1.5GHz quad-core processor, a huge 4.7-inch HD (1280 x 720) screen, 8MP camera and the Optimus 4X HD will run the latest version of Android, Ice Cream Sandwich. These specs put it in direct competition with the likes of the HTC One X.
LG has also officially announced its 'L-Style' range of phones which include a trio of new handsets the L3, L5 and L7. Check out our Hands on: LG Optimus L3 review, Hands on: LG Optimus L5 review and Hands on: LG Optimus L7 review. LG has also officially unveiled the Optimus 3D Max. It will offer brighter 2D and 3D displays with a built in 3D convertor meaning you will be able to make standard apps appear 3D. Check our our Hands on: LG Optimus 3D Max review. We have also come across the Optimus Vu which touts an unusual 4:3 5-inch screen. Check out our Hands on: LG Optimus Vu review. The Korean company also admitted to us at the show that it is considering a new LG tablet for Europe. MWC has always been a big launch time for the Taiwanese brand, and this year is no exception. The Endeavor has been announced as the HTC One X boasting a 1.5GHz quad-core processor, 32GB of internal storage, 8MP camera and version 4.0.5 of Ice Cream Sandwich with HTC Sense 4.0 overlay . There is no sign of a microSD card slot though, which we find a bit odd. Check out our Hands on: HTC One X review and Hands on: HTC Sense 4.0 review. The Ville has now been announced as the HTC One S, with the previously reported specs staying the same – 1.5GHz dual-core processor, 1GB RAM, 4.3-inch qHD display, 8MP camera with full HD video capture, Beats audio and Ice Cream Sandwich with the new Sense 4.0 interface. The third HTC handset is the HTC One V (previously rumoured as the Primo). The budget One V is being touted as the ying to the HTC Rhyme's yang - a version for the lads possibly? HTC also told us that it would rather like the opportunity to be the Android 5.0 Jelly Bean Nexus phone partner. We bet it would. The Finns have eschewed doing MWC 'properly' for the last couple of years - instead, we've sat through conferences about partnerships with Intel in off-campus locations to not much fanfare. This MWC is different. Before the event, Nokia released a video teasing a camera focussed handset to be announced at MWC. It's a reboot of the Symbian-powered N8, called the Nokia Pureview 808. It has a 41 megapixel camera. That's 41. Not 4.1. Check out our Hands on: Nokia 808 Pureview review. Yes, it really does have a 41MP camera! Our camera testing head honcho Angela Nicholson has also written in more detail about the camera - check out Why does a phone need a 41MP camera? There's also now a worldwide variant of the Lumia 900 plus a low end Windows Phone in the Nokia Lumia 610 - Hands on: Nokia Lumia 610 review. We'll also be privy to a whole host of new Asha phones rocking the S40 interface, but we're not expecting Nokia to make a huge deal of these puppies.